Over the last few years, we have seen the devastating effect of backroom deals, secret decisions and the lack of democratic control over issues that most affect us. In this context of social, economic and political crisis, we believe that resolving by decree such an important question as the form our state takes could give way to a long cycle of political instability and deepen the already very grave crisis of legitimacy of the system. That is why we propose initiating a process of open and plural debate in which all arguments are heard and decisions are democratically made in processes involving all citizens. In democracy the people decide. We are not subjects, we are citizens. 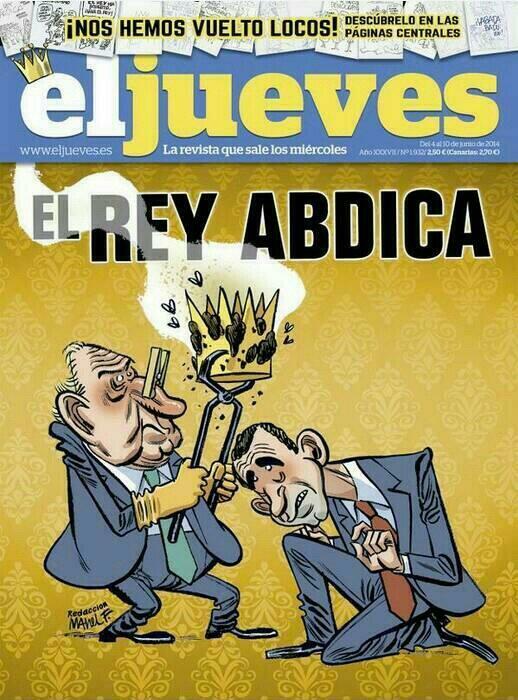 June 3, 2014 -- The grave situation, of an economic, social and political crisis, that our country is living through, has led to the abdication of the monarch and an accelerated attempt to impose another king on the Spanish people without taking into consideration the will of the people. For us, this decision is a direct consequence of the deterioration and collapse of the two-party system following the May 25 European elections, in which, for the first time in recent history, the two main parties that prop up the monarchical system received less that 50% of votes cast by citizens and the support of less than 20% of citizens eligible to vote. The crisis of the two-party system has become a crisis of the regime. That is why we are demand that the people, with whom sovereignty resides, be allowed to discuss and decide via a referendum, whether they want a monarchy or a republic, whether they want a monarchy or democracy. This is because we are citizens, not subjects, we do not want tutelages nor do we want citizens to be treated as though they are minors. Exercising our sovereignty means allowing the people to decide how they want to govern themselves. It is deciding among all of us what kind of country we want, which is why we demand a referendum that opens the path towards a constituent process in which we can collectively decide the kind of country we want to build. It is time for Democracy with a capital D, because the deterioration of the crown and the political institutions that have sustained it and led us into this unprecedented crisis, oblige us to, altogether, come up with a new way of government, a republic in which citizens are at the centre of politics, that projects a social change, a deepening of democracy and social rights. It is inconceivable that in the 21st century, hereditary rights trump the will of the people. The king is leaving because public opinion is against him. Those who want to defend a royal palace tainted by corruption, opacity and collusion with clientalist networks woven by the two-party system, want to change something in order to ensure that everything stays the same. But we are sure that this is not what our people want or need and, in any case, it should be the citizenry and no one else who decide. That is why we issue a call to political, social and cultural forces and all those citizens who want to exercise their legitimate right to decide on how we govern ourselves, to demand in a united manner a referendum in which the people decide, and thereby begin down the path towards a more just, more solidarity-based country. We call this project the Third Republic.